Glutinous Thoughts: Acetic Acid and Postprandial Glycaemia - RS as an Explanation? Thoughts on starch and the science of sweets from a salty scientist. Acetic Acid and Postprandial Glycaemia - RS as an Explanation? Not so long ago now, a certain Doctor Carol Johnston of Arizona State University’s Nutrition Department came to present at my university. Doctor Johnston is a highly accomplished nutrition researcher, and one whose work that I admit I read from time to time. Perhaps her most notable accomplishment – that is, most notable in that it has trickled down into the popular press and actually helped some people – is her investigation into the attenuation of postprandial glycaemia by the simple presence of vinegar taken prior to or concurrent with the meal. Obviously, such a simple measure could be of use to those people suffering from the metabolic defects of diabetes or who have generally sluggish metabolisms that prevent the rapid disposal of glucose from the bloodstream – no need to go into detail on mechanisms here, as I will treat those at a later time. My thesis advisor at the time was a very well-known researcher in the field of starch science and happened to inquire after the seminar whether the mechanism of complex formation with acetic acid (i.e. a type of RS5) had been considered as a plausible mechanism behind the observed metabolic effects of the vinegar doses in vivo employed by Johnston’s group. Well, no. Starch is an esoteric enough field that few people think of that. And so, I volunteered for the task and designed an experiment to test the proposition in vitro. The long and the short of it is this: no, Virginia. No, it does not account for the mechanism. However, the negative result was never published at my advisor’s will and the matter was dropped. Because these data would otherwise die in a notebook never to be opened again and I believe would be of benefit to this field of investigation, I am putting up the original paper that I wrote at the time for public viewing here, unaltered from its original state. The result that we obtained at the time might have been a definitely negative one, but I am not without an hypothesis as to how the mechanism occurs. The paper is to be found below the break, and I shall address what I believe to be a quite probable cause as to the lowering of postprandial blood sugars by the mere imbibing of vinegar in the next post, for to the best of my knowledge, the exact nature of the biomolecular interplay has never been elucidated. Starch is a primary staple in human diets worldwide. Rapid digestion of starch results in a steep rise in postprandial blood sugar and insulin concentrations that may have adverse health consequences if such elevated levels are chronically sustained, as in diabetes mellitus. Administration of ingested vinegar prior to meals has been investigated as a component of treatment for diabetic patients comparable to some drug therapies (Johnston and others 2004, Liatis and others 2010). The postprandial glycaemic lowering effect of vinegar was first documented in rats administered a cooked cornstarch paste containing 0 or 2% acetic acid through intestinal intubation by Ebihara and Nakajima (1988). Ingestion of vinegar has been shown to significantly decrease postprandial glycaemia compared with placebo controls in subjects fed carbohydrate-rich meals incorporating both starch and simple sugars, including bread (Ostman and others 2005), potatoes with skimmed milk (Liatis and others 2010), mixed meal with bagel, butter, and orange juice (Johnston and others 2004), and strawberry vinegar mixed with sucrose (Ebihara and Nakajima 1988). Starch is chiefly comprised of two glucose homopolysaccharides, amylose and amylopectin. Amylose is a primarily linear molecule made up of α-1,4 lined anhydroglucose units, whereas amylopectin is a large, highly branched glucose polymer with abundant α-1,6 branch linkages. Starches from normal botanical sources contain between 20 – 30% amylose, while waxy starches contain no or very little amylose. Amphiphilic molecules, such as fatty acids, are known to form helical complexes with starch chains (Ai and others 2013). Complex formation is governed by hydrophobic interactions of the hydrophobic moiety of these molecules with the interior hydrophobic cavity of linear starch chains, namely amylose and long amylopectin branch-chains. Short amylopectin branch chains, such as those found in cereal starches, exhibit minimal helical complex formation. Small molecules known to form helical complexes include phenol and n-butyl alcohol, the latter of which is used to fractionate amylose from native starch via this complex formation (Takeo and Kuge 1968). Acetic (ethanoic) acid, the active ingredient in vinegar, shares this amphiphilic quality and may therefore participate in helical complex formation with starch chains. However, the physiological relevance of this interaction with respect to the antiglycaemic effects of vinegar is not known. The aim of this study was to determine whether the postprandial antiglycaemic effect exerted by vinegar may be attributed to formation of a double-helical amylose inclusion complex with acetic acid, which may increase resistant starch formation and decrease the rate of digestion in vivo, or a physiological mechanism not presently well understood. Two experiments are described: in Part I, the effects of a physiologically-relevant dose of acetic acid on digestibility of starch paste in the presence or absence of amylose are described. Part II describes the digestibility of a prepared starch-acetic acid complex with up to 10 wt% acetic acid (dsb) made by precooking and predrying of starch paste prior to hydrolysis. Digestibility of freshly-prepared starch pastes are also described in Part II. 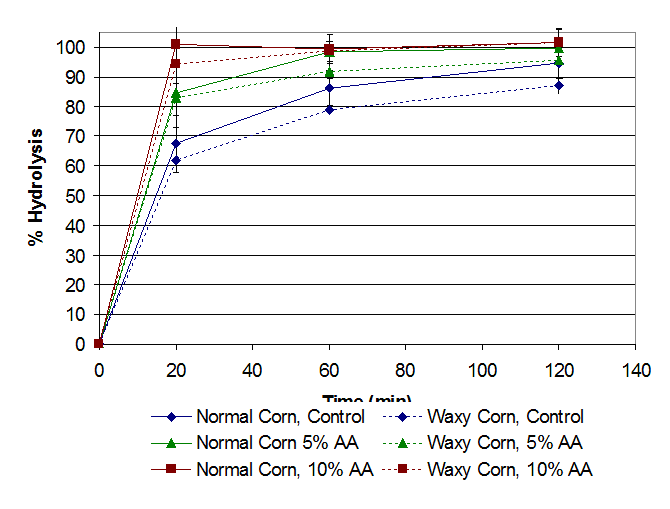 Normal corn starch (NC) and waxy corn starch (WC) were from Cargill and American Maize Products, respectively. Acetic acid, sodium acetate, calcium chloride, sodium phosphate (mono- and di-basic) were from Fisher Scientific (Waltham, MA). Porcine pancreatin (P-7545)) and amyloglucosidase (A-7095) were from Sigma-Aldrich (St. Louis, MO). Glucose-oxidase peroxidase (GOPOD) assay materials for quantification of starch hydrolysis were from the Total Starch quantification kit sold by Megazyme (Wicklow, Ireland) and were prepared according to kit directions. Experimental conditions in Part I were chosen to reflect realistic intakes of acetic acid as vinegar with meals and normal behaviour of humans in adding vinegar to meals. 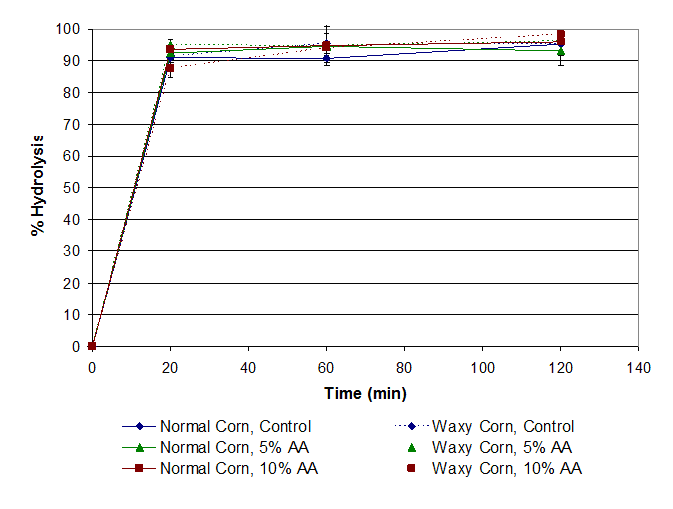 NC containing 28.6% apparent amylose WC containing 0.26% apparent amylose were selected in this study to compare the influence of amylose on starch digestibility in the presence of acetic acid. Briefly, 0.5 g (dsb) NC and WC were measured into 50-mL centrifuge tubes fitted with screw caps (Corning, NY) to which 7.5 mL sodium phosphate buffer (100 mM, pH 6.9, 0.02% NaN3, 0.005% CaCl2) was added with a stir bar. Samples were cooked in a > 95 °C water bath for 10 min with stirring to form a paste. Following cooking, 2.5 mL of distilled, deionized (DI) water, 5% acetic acid solution (v/v), or 10% acetic acid solution (v/v) were added to starch pastes and mixed thoroughly with a vortex mixer. Concentrations of 5 and 10% acetic acid solutions prior to addition to starch pastes were 0.874 and 1.749 M, respectively; approximate acetic acid concentrations after addition to starch paste samples were 0.219 and 0.437 M, respectively. Samples were capped and placed in a 37 °C water bath with lateral shaking (80 rpm) for 1 h to allow for formation of starch-acetic acid complex. Sample pH was adjusted to 6.9 following equilibration using 0.5 M NaOH, and total volume was adjusted to 15 mL with DI water. Samples were returned to the 37 °C water bath to equilibrate for 30 min. Englyst method enzyme solution (2.5 mL, see below) was added to samples, and 250 μL sample aliquots were removed to tubes containing 10 mL 66% ethanol at 0, 20, 60, and 120 min for determination of rapidly digestible starch (RDS), slowly digestible starch (SDS), and resistant starch (RS) fractions. The Englyst method for RS determination was used in this study with minor modifications because this method is designed to emulate the actual human digestive process as closely as can be achieved in vitro (Englyst and others 1992). To make up enzyme solution added to samples, 3.0 g of porcine pancreatin was suspended in 20 mL of distilled water in each of 4 50-mL centrifuge tubes using a vortex mixer and was stirred for 10 min with a stir bar. Tubes containing pancreatin slurry were centrifuged at 1500 g using a Sorvall RC 5B Plus laboratory centrifuge (Fisher Scientific) for 10 min and 13.5 mL of the supernatant from each tube was removed to a clean beaker. Concurrent with this preparation, 3.15 mL of amyloglucosidase was suspended in 3.6 mL of distilled water. Diluted amyloglucosidase (6 mL) was added with 4 mL of distilled water to pancreatin supernatant and mixed. Enzyme solution was prepared immediately prior to use each day. The protocol used in Part II was designed to maximize helical complex interaction between starch chains and acetic acid molecules according to the method of Ai and others (2013). NC and WC (4.0 g, db) were cooked with 3x of water (w/w) and 0, 5, or 10% acetic acid (w/w, dsb) in a ≥ 95 °C water bath for 8 min with constant manual stirring to ensure that starch was completely gelatinized. Starch pastes were dried overnight in a 50 °C convection oven and were ground to a powder using a coffee grinder (Mr. Coffee®, Sunbeam Products, Cleveland, OH). Ground starch pastes (0.5 mg, dsb) of NC and WC cooked without acetic acid as control (NC-C and WC-C, respectively), 5% acetic acid (NC-5 and WC-5, respectively), and 10% acetic acid (NC-10 and WC-10) were measured into 50-mL centrifuge tubes with 15 mL sodium phosphate buffer (100 mM, pH 6.9, 0.02% NaN3, 0.005% CaCl2). Tubes containing ground starch paste and phosphate buffer were homogenized using a T25 ULTRA-TURRAX® benchtop homogenizer (IKA Works, Staufen, Germany) at 11000 rpm for 45 s and were placed in a 37 °C water bath with shaking (80 rpm) for 30 min to equilibrate. Samples were hydrolyzed using the Englyst method procedure for RS content determination described in Part I. Treatment of NC and WC starch pastes with aqueous acetic acid solutions representing vinegar (5% acetic acid) and twice-concentrated vinegar (10% acetic acid) after cooking to represent addition of vinegar to starchy ingesta in the stomach did not significantly affect starch digestibility compared with controls (Figure 1A). Proportions of RDS, SDS, and RS fractions determined in starch pastes were generally not significantly different, and no apparent dose-dependent effect of acetic acid on starch fractions was observed. Several reasons may exist for this apparent non-interaction of acetic acid with starch pastes. Equilibration time of 1h may not have been sufficient to induce helical complex formation with acetic acid, although this equilibration time was chosen to reflect residence time of chyme in the stomach prior to emptying into the duodenum for amylolytic digestion to occur. Molar concentrations of acetic acid in the final starch paste may have been insufficient to maximize helical complex formation. Therefore, the influence of two levels of acetic acid addition on digestibility of predried starch pastes were investigated. Digestibility of precooked, dried, and ground (PDG) starch pastes containing 0, 5, and 10% acetic acid (dsb) during cooking were significantly different (Figure 1B). Digestion rates of the PDG starch pastes were lower than that of starch pastes with the addition of aqueous acetic acid solution, indicating that the drying process increased the SDS and RS fractions and decreased the proportion of RDS fraction (Table 2B) relative to that of undried starch pastes, most notably in the control treatments without addition of acetic acid. This change in the proportion of starch fractions is attributed to retrogradation of starch chains during overnight drying. This interpretation is supported by the observation that digestibility of NC pastes, which contain about 30% amylose, were uniformly lower than that of WC pastes, which contain no amylose. Amylose content is a strong determinant of starch digestibility rate due to the formation of double-helical crystalline complexes of linear starch chains, resistant starch type 3 (RS3) during retrogradation. Digestibility of freshly-prepared starch pastes containing similar amounts of acetic acid during cooking to investigate effects of starch-acetic acid complex formation in the absence of retrogradation during drying and storage (Figure 1C). Digestibility of NC and WC pastes for control, 5%, and 10% acetic acid treatments were not significantly different between starches, but digestibility also increased with increasing concentrations of acetic acid in a dose-dependent fashion. This result also appears to support the interpretation that hydrolysis of starch chains occurred in preference to RS-generative helical complex formation in acetic acid treatment of starch pastes cooked with a minimum of water. 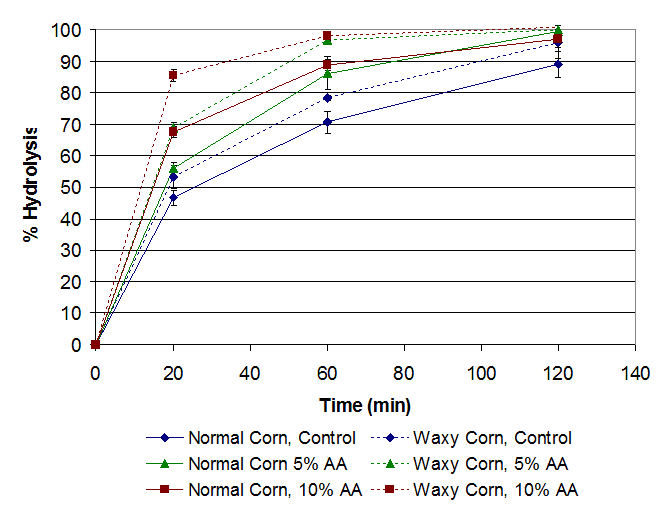 PDG starch pastes were digested more quickly in a dose-dependent fashion upon addition of acetic acid for both NC and WC pastes (Figure 1B). Proportions of SDS and RS fractions in PDG pastes generally decreased and RDS generally increased upon addition of acetic acid, although SDS was not significantly different in NC PDG starch pastes except for the addition of 10% acetic acid (Table 2B). Relative proportions of SDS and RS decreased and RDS increased in freshly-prepared starch pastes in a similar dose-dependent fashion upon cooking with acetic acid (Table 3B). Addition of acetic acid would be expected to result in an increase in SDS and/or RS fractions and a decrease in the overall digestibility rate if helical complex formation with acetic acid was a predominant process in the lowering of postprandial glycaemia by vinegar. The observation that addition of vinegar instead decreases these starch fractions and increases digestibility rate suggests that acid hydrolysis of starch chains during gelatinization is favoured over complex formation. Acid hydrolysis of starch chains is expected to increase digestibility by lowering average DP of starch chains and inhibit recrystallization of amylose and amylopectin branch chains necessary to formation of RS during drying. Based on these results, we conclude that formation of a starch-acetic acid complex is not a significant contributing factor in the lowering of postprandial glycaemia by pre- or co-ingestion of vinegar. Starch digestibility does not appear to be influenced by formation of a complex with acetic acid when confounding factors (e.g. pH) are minimized. Digestibility of starch pastes cooked with acetic acid to maximize complex formation was increased, which suggests that acid hydrolysis predominated over formation of starch-acetic acid complex. These results appear to implicate an alternative mechanism for the lowering of postprandial glycaemia due to vinegar ingestion such as reduced rates of gastric emptying or hitherto unexplored hormonal influences of acetic acid ingestion. Just What is this Mess?